McGee Young was among the first batch of entrepreneurs nurtured through the Water Council's BREW program. MeterHero rewards users for using less water and electricity. McGee Young came up with the idea with his students at Marquette University. The story starts a few years ago, when McGee Young was teaching a course on innovation and sustainability. He and his students wanted to find a way to help people realize how much water they use. “How much water do we use is a question most of us can’t answer and so we put a software application up on the internet where you could type in your address and see how much you were using and how that compared to people around you,” McGee says. They christened their invention H20Score and people liked learning how they measured up, but McGee says it wasn’t a business. So, he turned to water utilities. He thought they might want to reward customers for using less H2O. McGee says his pitch fell flat. “The irony is that as water problems become more severe, we’re relying on institutions designed to provide us with more water, they were built in an era of surplus and we’re trying to use them in an era of scarcity,” he says. McGee want back to the drawing board. He and his students developed a new model – with a new name, MeterHero. It folds in both water and electrical use, and rewards consumers for using less. 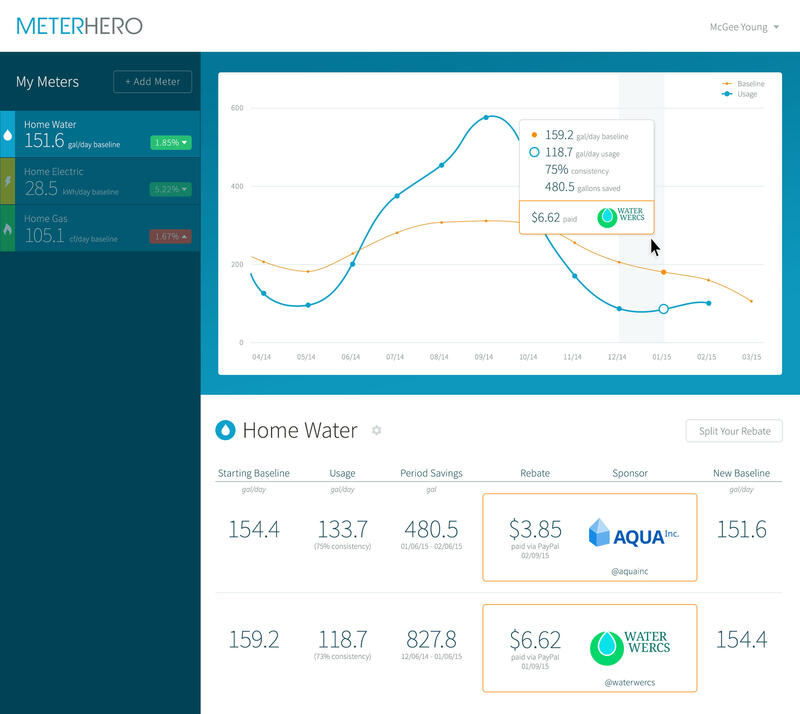 The MeterHero dashboard allows users to track their water, electric and gas usage, and money earned by reducing usage. “And pays you a penny a gallon for the water you saved, and 10 cents per kilowatt water for the electricity you saved, and so now at the end of the month, when you get your bill, not only are you paying a little less, but you’re getting a little bit extra in your bank account. And that actually motivates people quite differently than just the bill saving,” McGee says. McGee enlists businesses intrigued by the benefits of financing the rebate. “People in their homes who are saving, will now learn about your sustainability commitment as a company and that’s a real powerful argument for a lot of companies who want to connect with green-minded consumers,” he says. McGee also found ways for MeterHero to offer more than environmental and monetary benefits. “We deployed this first in schools – so this is really great way to teach middle school kids how to learn math and science. And it was so successful that we actually spun out a separate program called STEMhero,” he says. One of McGee’s former students runs it out of Milwaukee. “And that’s being used by kids all across the country. So we have hundreds of students today logging in their home’s water and energy use, and then using that in math class to learn concepts like graphing and in environmental studies classes to learn about climate change,” McGee says. McGee had a luxury of evolving from H20Score to MeterHero under the wing of the Milwaukee Water Council. He was among the entrepreneurs it selected for its inaugural BREW program in fall of 2013. Three months after he “graduated,” McGee moved his startup – along with his wife and two young daughters to Oakland, California. His goal is to save a billion gallons of water this year. McGee admits to uncertainty, but feels compelled to try. “Every morning I wake up and I go, ‘oh my gosh – this is the dumbest idea ever’ and I don’t think that doubt will ever go away, but it really is just a matter of imagining that there’s another reality that can exist in this world and working really hard to make it exist,” he says. McGee might be feeling a bit more settled now. Since we met a month ago, the number of people enrolled in MeterHero has more than tripled. Most are from his new base in California. Longer conversation with McGee Young aired on Lake Effect May 18, 2015. Thursday afternoon the Water Council announced the second round of start ups chosen to work inside the Global Water Center. During the opening of the Global Water Center last September, a conversation among women whose professions involve water, evolved from casual to inspired. Rexnord Corporation already leases space in the Global Water Center but, this summer, will relocate corporate executives there, from West Milwaukee. Thursday night, The Global Water Center officially opened in the Walkers Point neighborhood. We meet a couple of entrepreneurs who now share the third floor.